My first certification came from co teaching a local PADI Open Water dive course with an experienced instructor. The first two Open Water dives were at Lake Coleridge and we completed the last day at Wainui over on the Banks Peninsular, the weather was awesome! Sun shining, no wind, and flat bay to dive in. 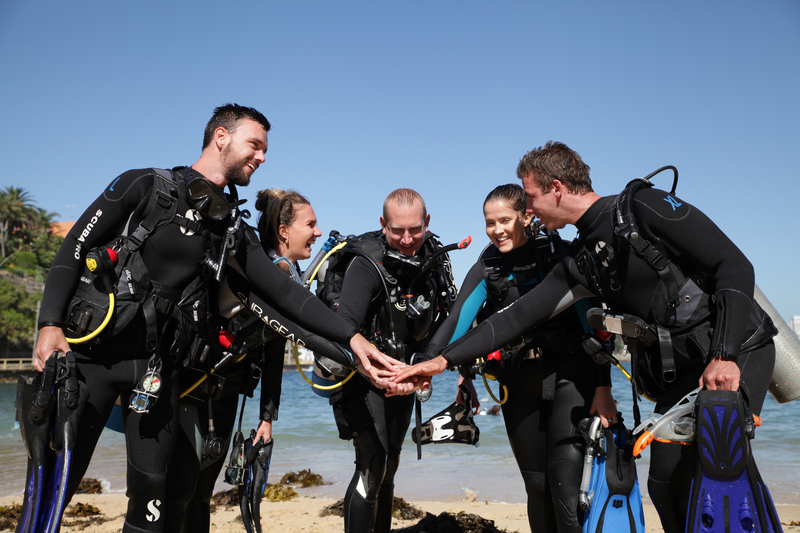 We got geared up and walked down the rocky path to the water’s edge, where we briefed the dive and entered the water to complete the dive skills. We found a nice flat patch of sand at six meters deep to complete the skills, first up was mask removal and replacement and second was an oral hover (for anyone how isn’t familiar with open water skills this this is a neutral buoyancy skill were you inflate your BCD orally and hover mid-water as if you were an astronaut in space). Then we swam around and explored the dive site a bit more, we swam through a mini kelp forest and saw two HUGE Blue Moke! Everyone was buzzing. When we had reached our turn pressure for the dive we swam back to our ascent line and surfaced. I have never before seen six fifteen year olds with such big toothy grins, the quietest and shy kid of the group spat his Reg out of his mouth and could not stop talking bout how awesome that dive was! I knew at that point that being a dive instructor was all about sharing my experiences with people and give them the ability to make and share new adventures and memories with friends, family and other divers all over the world. After our second briefing for the final dive of the course, we descended and completed the last couple of skills, and explored more of the dive site. Akita was leading the way and I was following from the rear, after exploring the reef more it was time to ascend. We started our ascent with the other half of the group from about ten meters deep. As we approach five meters, I signal for the students to stop and do a safety stop, so we all adjust our buoyancy and hover mid water to do what is called a blue water safety stop (this is where you conduct a safety stop in mid water with neither the bottom or surface of the water is visible and no other visual reference available). We float there like astronauts in space completely weightless for three minutes, then complete our ascent to the surface. I thought to myself while we were doing our safety stop that wow these students have gone from being clumsy and uncoordinated in the first pool sessions to doing one of the hardest and most disorienting skill in diving without even batting an eyelid, I was gob smacked with how far these kids had come in just four days of learning to dive. The whole hour and a half van ride home was filled with stories of what they had all seen, plans of where they all wanted to dive around New Zealand and in some cases other countries. This was the moment that we had trained for, seeing new PADI Open Water divers so happy and enjoying themselves it really makes becoming an instructor so rewarding.